I've been having something of a Richard Dix festival this week! Having enjoyed HELL'S HIGHWAY (1932) and SPECIAL INVESTIGATOR (1936), several of my fellow Dix fans recommended I next watch him in THE KANSAN (1943). THE KANSAN was indeed as enjoyable as advertised! Dix plays John Bonniwell, who has stopped in a frontier town while traveling to Oregon. The fast-drawing, straight-shooting Bonniwell thwarts a bank robbery by the James gang. When the wounded Bonniwell wakes up in the hospital, he soon learns that he's been elected town marshal by the appreciative townspeople. The dubious Bonniwell considers continuing on to Oregon, but it doesn't hurt there's a lovely hotel owner named Eleanor (Jane Wyatt) in town, and he agrees to take the job. 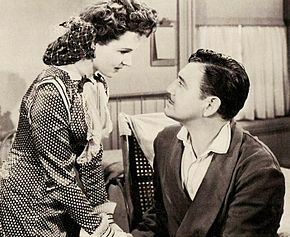 Bonniwell quickly learns that banker Steve Barrat (Albert Dekker), who owns most of the land in the area, wants to use Bonniwell to enforce legally sound but morally dubious court orders. Bonniwell must navigate his way through a number of crises precipitated by Barrat, figuring out and dealing with Barrat's end game. 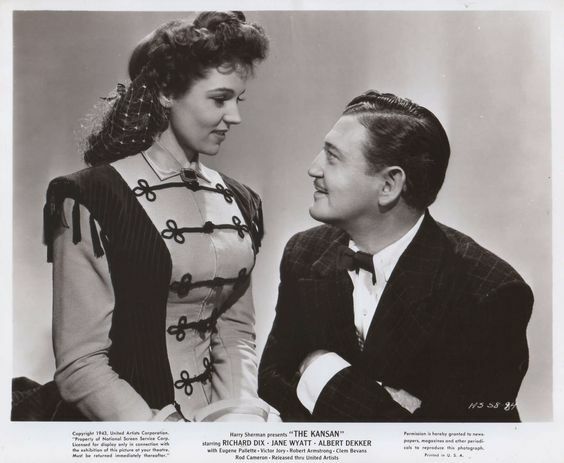 Meanwhile, Barrat's gambler brother Jeff (Victor Jory), who is in love with Eleanor himself, is an unpredictable player in the unfolding events. THE KANSAN has many positive attributes, starting with an interesting script, written by Harold Shumate from a story by Frank Gruber. Aside from Dix, who is excellent, the film has a crackerjack part for Victor Jory as Jeff. The viewer never knows exactly which way Jeff will go; one might say he's sort of an ethical semi-villain! Wyatt has a nice role as Eleanor, who went into business on her own after her father's death. Her Eleanor is a fine lady in every sense of the word. She likes Jeff and appreciates his interest but is smart enough to hold him at bay, and she also quickly recognizes that John Bonniwell is a quality man. There's an excellent supporting cast, including Eugene Palette and Robert Armstrong as Bonniwell's friends. Look for Rod Cameron as a trigger-happy cowboy Bonniwell has to shoot in the arm -- after which Bonniwell pays his hospital bill! Also in the film are Willie Best, Beryl Wallace, Hobart Cavanaugh, Douglas Fowley, Byron Foulger, and Jason Robards Sr., to name a few. Another pleasing aspect is a campfire song sung by The King's Men just before a big action sequence. 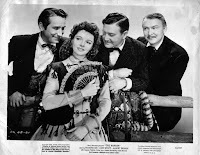 The King's Men also sang on the soundtrack of Dix's THE ROUNDUP (1941) a couple years previously. 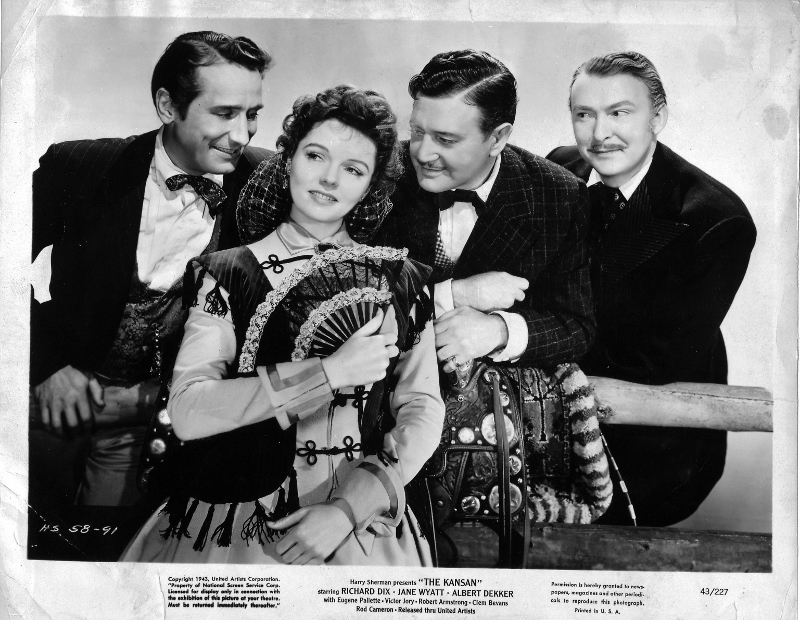 THE KANSAN was a United Artists film produced by Harry Sherman and directed by George Archainbaud. The cinematographer of this black and white film was Russell Harlan. It runs 79 well-paced minutes. I recorded THE KANSAN fairly recently from Turner Classic Movies. It was a weaker print than is typically seen on TCM, though it was still quite watchable. It's also available on DVD from Alpha. Given the variable quality of Alpha's public domain films, I'd be surprised if the print is any better than the one seen on TCM. Previous reviews of Richard Dix films: THE PUBLIC DEFENDER (1931), HELL'S HIGHWAY (1932), SPECIAL INVESTIGATOR (1936), IT HAPPENED IN HOLLYWOOD (1937), SKY GIANT (1938), TWELVE CROWDED HOURS (1939), MEN AGAINST THE SKY (1940), THE ROUNDUP (1941), and TOMBSTONE: THE TOWN TOO TOUGH TO DIE (1942). I LOVE this Richard Dix kick you are on-a "one woman crusade" if you will. He certainly deserves more attention and he's certainly getting it here. I enjoyed your take on RIDING SHOTGUN and all the responses that post generated. RIDING SHOTGUN which I also enjoy. recommend them,although they all have disturbing elements. I really wish TCM would give us a Richard Dix Western Collection. TRAIL and STAGECOACH,(basically the Thirties) were "Kiddie" Westerns. re-make of 3.10 TO YUMA was better than the original. on these sort of things. "A Richard Dix Western Collection" - what a great idea! Unfortunately, some of the films were released through United Artists and some through Paramount. Nuff said! Thanks for watching, reviewing and enjoying "THE KANSAN", Laura! Good to put these minor classics on the map. Great to hear from you! Delighted you're enjoying the Dix Festival. I have more titles lined up from him including BLIND ALIBI, BUCKSKIN FRONTIER, RENO, and THE ARIZONIAN. Just need more hours in the day to watch! LOL. Haven't seen any of THE WHISTLER yet but I have some here so that's also on my list! Also enjoyed getting your take on DECISION AT SUNDOWN. It's interesting to hear what people think of that one. Many thanks for the compliment for me and my esteemed blogging colleagues. It's great to have multiple places to go to "talk Westerns"! Don't know this one but will watch out for it. Haven't really seen much of Richard Dix. The Alpha DVD is, as Laura says, all there is sadly. But I pulled my copy today just to check p.q. again - it isn't too bad at all though a restoration (unlikely) of all Dix's westerns would be VERY welcome. Vienna, I hope you enjoy it! Jerry, many thanks for the report on the Alpha DVD. One of the biggest problems with the print shown on TCM was that the soundtrack was fairly fuzzy -- I had to turn it up quite loud. The picture was soft but, as you describe the Alpha, not bad. No problem with the soundtrack on the Alpha, Laura. Luckily!! I'm glad to hear that you got a chance to see THE KANSAN, and liked it. Good review, you highlight the film's many strengths nicely. Good one with "ethical semi-villain!" Dix has such a calm dignity and steadiness here, he again demonstrates his versatility. Frank Gruber seems to like utilizing both real-life Western personages in his work and historically inspired fictional characters. THE KANSAN, besides having Jesse James appear at the beginning, seems to draw partly on the Wyatt Earp story. 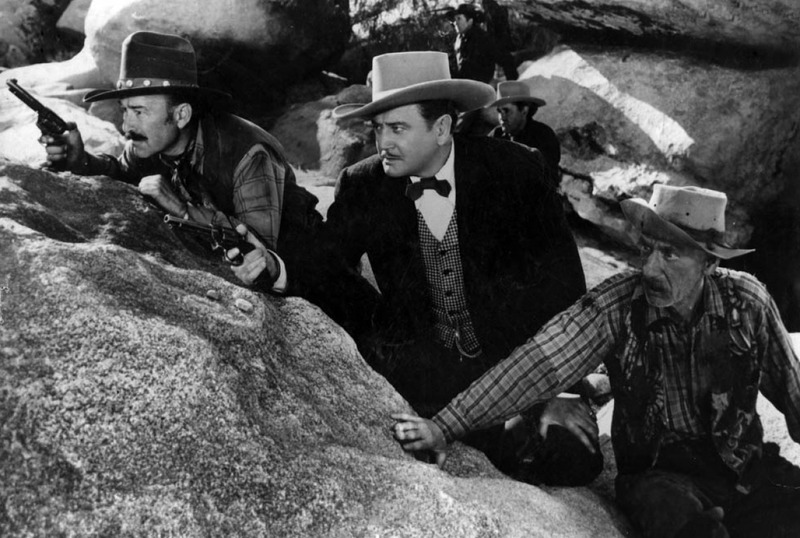 Gruber also wrote the novel that TENSION AT TABLE ROCK was based on, which explores what happens when the hero is unjustly branded as a "dirty little coward, who shot Mr. Howard" type, after killing a revered outlaw. Gruber told the Reno Brother's story in RAGE AT DAWN, and did both the screen-play and story for THE GREAT MISSOURI RAID, and FIGHTING MAN OF THE PLAINS (which latter film impressed me with it's more-accurate-than-usual movie treatment of the Missouri Partisans, aka Bushwackers). He also created the TALES OF WELLS FARGO tv series, which utilized the usual famous names like Jesse James, John Wesley Hardin, Sam Bass, and Belle Starr, but also featured some lesser known personages like Henry Plummer, Doc Bell, Bill Longley, Ben Thompson, and Clay Allison. Thanks so much, Maricatrin, I'm glad you and Jerry encouraged me so strongly to give it a try. Good description of Dix by you above. Very interesting background information on Frank Gruber, information like that which adds to the context is always appreciated!